Used in a two-part foam applicator unit from Specialty Products, Inc., CPC’s DrumQuik® PRO dispensing system protects workers and materials. Two-part urethane foams and polyurea elastomer spray-on coatings are found in diverse applications, from construction uses, such as home insulation, commercial roofing and joint fillers, to waterproofing of fishing vessels and submarines. The coatings are created and applied by specialized equipment that first mixes two base chemicals that react together to create either expanding urethane foam or a durable elastomeric coating, depending on the combination of chemicals. 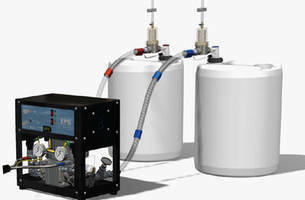 When Specialty Products, Inc., a leading manufacturer of the application equipment, was looking for a durable and easy-to-use solution for feeding the A-type and B-type chemicals to its LPG (low-pressure gear proportioner) applicator machine, it turned to CPC and the company’s DrumQuik PRO dispensing system. The two base chemicals used are liquids with the consistency of molasses at room temperature. When mixed together during the application process, the resulting two-part foam or elastomer begins to cure instantly, the same way a two-part epoxy does. The A-type chemical is usually isocyanate and the B-type chemical varies with the type of application - either a chemical that produces expanding urethane foam or a chemical that produces a smooth elastomeric coating. While the mixed and cured products are safe and nontoxic, the base chemicals are not, requiring workers to wear protective clothing, respirators and gloves when handling chemical containers and operating the application equipment. SPI’s implementation of DrumQuik PRO’s closed dispensing system helps prevent worker exposure to fumes or the base chemicals themselves. 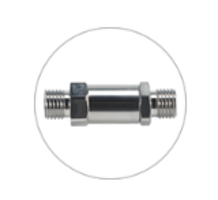 The DrumQuik PRO dispensing system consists of a coupler that connects to a pre-installed drum insert and dip-tube assembly in the bulk chemical containers. 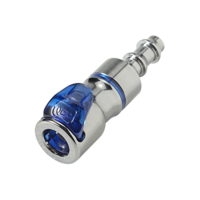 The coupler has an output port for the chemicals and a vent port, allowing compressed air to force the chemical out of the container during application. “To get the chemicals to flow better, we use heat blankets to bring the containers up to about 90 degrees, which allows the product to thin out for easier application,” said Fleming. “From there, the containers are pressurized to about 5 psi, and that pushes the material out through the DrumQuik PRO couplers and into our machine. The machine has gear pumps on both the A- and B-side that pump the product through the line to the mixing gun. A typical hose to the gun is 25–50 feet long, or it could be 200 feet. The materials mix and come out of the gun and we either use air nucleation to make it come out as a spray, or we can also use a pour kit to caulk or fill seams in concrete,” he said. The chemical containers have drum inserts and dip-tubes of various lengths for each container size. 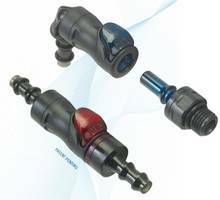 To make sure the right supply line is connected to the right chemical container before application begins, the A-type coupler has a red color code and the B-type coupler has a blue color code. To connect the A-type and B-type chemicals to the LPG, the operator simply removes the shipping plug from the pre-installed, color-coded drum insert, inserts the matching coupler and turns the locking ring. At no time are the operators exposed to the unmixed chemicals during the changeover process. When the chemical containers are empty, the operator just removes the coupler and re-inserts the shipping plug. The pre-installed dip-tube is designed to bend into the corner of the chemical container in order to extract as much of the chemical as possible. This design prevents waste and reduces recycling costs for the empty containers. “CPC has been working with SPI for quite some time,” said Thomas Braun, inventor of the DrumQuik PRO system and business manager of chemical and packaging products at CPC in St. Paul, Minnesota. “The driving motivation for SPI was to better control the supply of a two-part component for a urethane foam application system. The DrumQuik PRO system also eliminated the removing and replacing of dip-tubes in the field, saving time and reducing chemical exposure for the operators. SPI is making good use of the color-coding and ported vent features of the DrumQuik PRO system, so they are truly using the full palette of benefits that DrumQuik PRO provides,” he said. Adrian Zettell, owner of Dragon Spray Systems, uses the Specialty Products, Inc., LPG unit to spray polyureas and foam in a variety of oil industry applications, such as treater vessels, secondary containment liners and foam coatings on tanks. The chemicals Dragon Spray uses are fed to the LPG proportioner through pre-installed DrumQuik PRO dispensing assemblies in 15-gallon and 55-gallon chemical containers. Because the DrumQuik PRO is a closed system, it eliminates the risk of chemical exposure for workers and protects the chemicals from contamination. The system provides another advantage for Zettell’s company because, in some instances, its services are delivered from a mobile trailer. “The LPG unit equipped with the DrumQuik isn’t like a standard transfer pump where you have to pull it up all the way out of the drum to change chemical containers, so we don’t need double the drum height for trailer clearance,” said Zettell. A dip-tube sits in and stays within the drum and then a secondary piece screws right into the DrumQuik PRO with alignment tabs. “Simple is very effective. The DrumQuik PRO system speeds up the installation and transfer process from one unit to another. Line it up, pop it down, give it a twist,” said Zettell.